So often an illness in your pet can quickly become life threatening. Quick diagnosis is important and we often don't have 24 hours to wait for lab tests to come back. With our Idexx Lab equipment, we can have a general screen (full CBC, electrolytes, chemistry screen and urinalysis) performed within about 12 minutes. Thyroid testing is available with an approximate turn around time of 40 minutes. 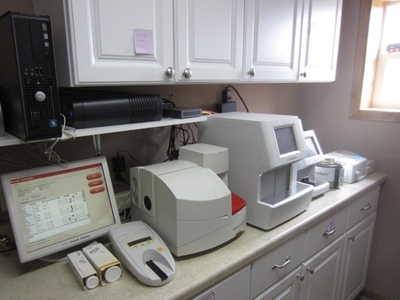 For more specific testing, we use external laboratories that send results back to us digitally in generally 1-5 days. 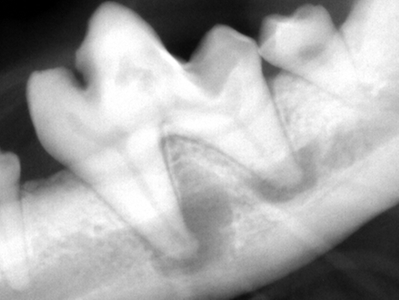 Digital dental x rays allow us to examine teeth for problems such as the abscess in this photo quickly and easily. Digital xrays provide for better detail and immediate results. We all know that tooth aches are no fun and with this technology we can better assess if you pet is experiencing dental pain. They can't tell us they have a nagging toothache. .